Commission Regulation (EC) No 1251/2008 of 12 December 2008 implementing Council Directive 2006/88/EC as regards conditions and certification requirements for the placing on the market and the import into the Community of aquaculture animals and products thereof and laying down a list of vector species (2) lays down placing on the market requirements, including animal health certification requirements, for movements of aquaculture animals into areas covered by national measures approved by Commission Decision 2010/221/EU of 15 April 2010 approving national measures for limiting the impact of certain diseases in aquaculture animals and wild aquatic animals in accordance with Article 43 of Council Directive 2006/88/EC (3). Since 2008, increased mortality in Pacific oysters (Crassostrea gigas) has occurred in several areas in Ireland, France and the United Kingdom. The epidemiological investigations undertaken in 2009 suggested that a newly described strain of ostreid herpesvirus-1 (OsHV-1), namely OsHV-1 μνar, played a major role in the increased mortality. 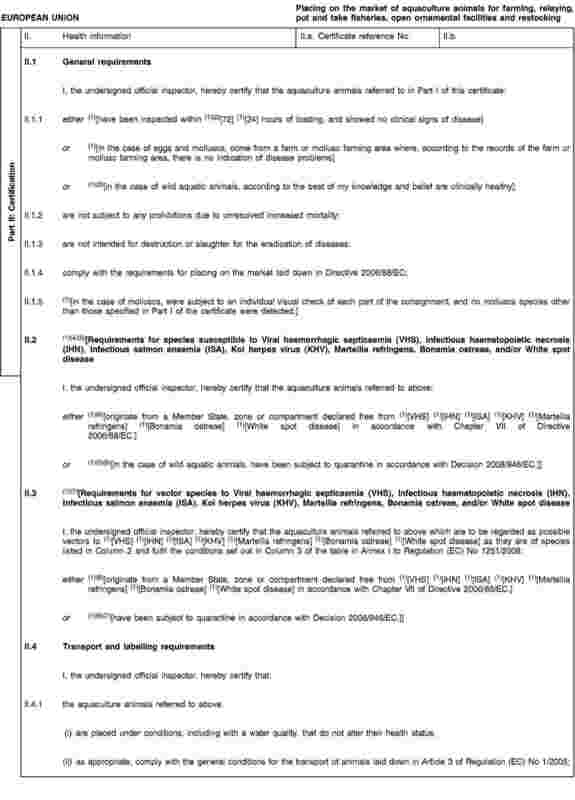 Commission Regulation (EU) No 175/2010 of 2 March 2010 implementing Council Directive 2006/88/EC as regards measures to control increased mortality in oysters of the species Crassostrea gigas in connection with the detection of Ostreid herpesvirus 1 μνar (OsHV-1 μνar) (4) was adopted with the aim of preventing the further spread of OsHV-1 μνar. It introduced measures to control the spread of that disease and it applies until 30 April 2011. Decision 2010/221/EU, as recently amended by Commission Decision 2011/187/EU (5), allows the Member States listed in Annex III thereto to impose placing on the market requirements on the movement of Pacific oysters into areas covered by approved surveillance programmes, in order to prevent the introduction of OsHV-1 μνar into those areas. In the interests of clarity and simplification of Union legislation, the respective placing on the market requirements should be laid down in Regulation (EC) No 1251/2008. 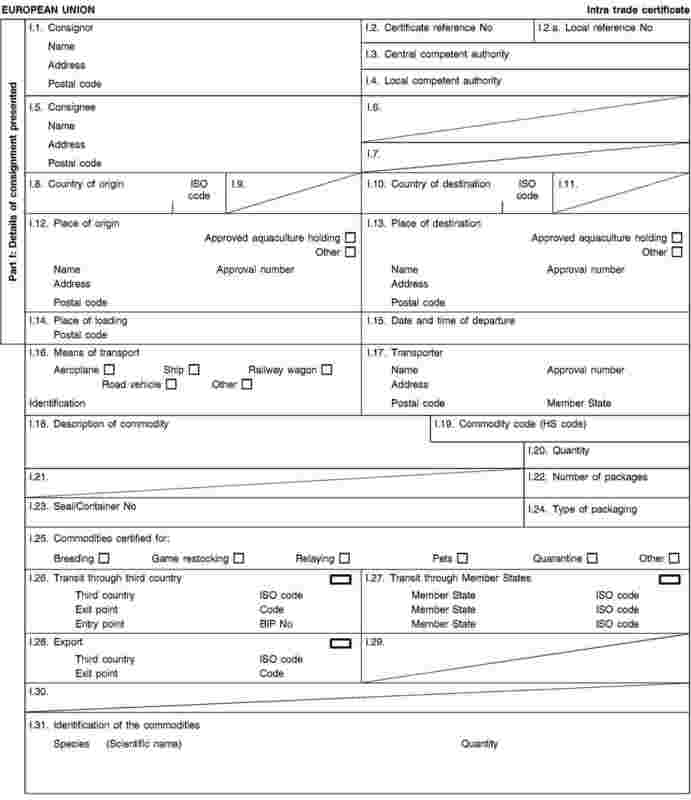 In order to prevent the introduction of OsHV-1 μνar into Member States or parts thereof listed in Annex III to Decision 2010/221/EU, consignments of Pacific oysters intended for farming or relaying areas, and for dispatch centres, purification centres or similar businesses before human consumption, introduced into such Member States or parts thereof, should originate from an area with an equivalent health status. To ensure that those requirements are complied with, such consignments should be accompanied by an animal health certificate providing the necessary attestations. 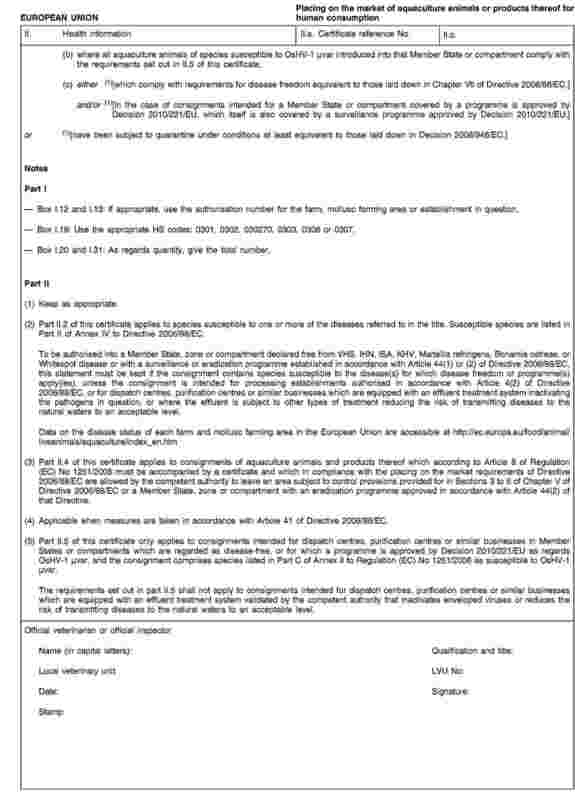 Regulation (EC) No 1251/2008 should therefore be amended accordingly. It is appropriate to provide for transitional measures to allow Member States and the industry to take the necessary measures to comply with the requirements laid down in this Regulation. To avoid the further spread of OsHV-1 μνar, this Regulation should apply immediately following the date of expiry of Regulation (EU) No 175/2010. are of species which are listed in Part C of Annex II as species susceptible to the disease(s), for which a surveillance programme applies in accordance with Decision 2010/221/EU, as referred to in point (a). 2. 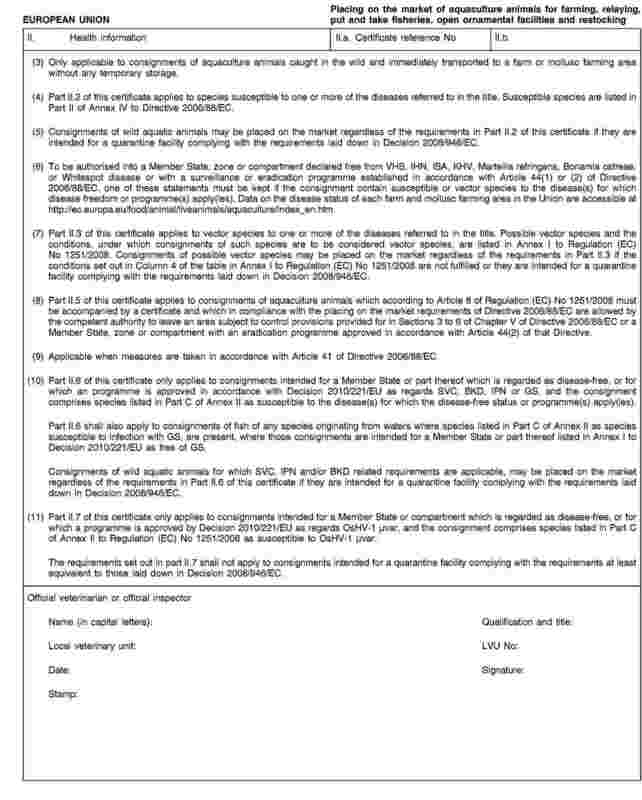 Consignments of live molluscs referred to in paragraph 1 shall comply with the animal health requirements set out in the model animal health certificate and explanatory notes as referred to in that paragraph. 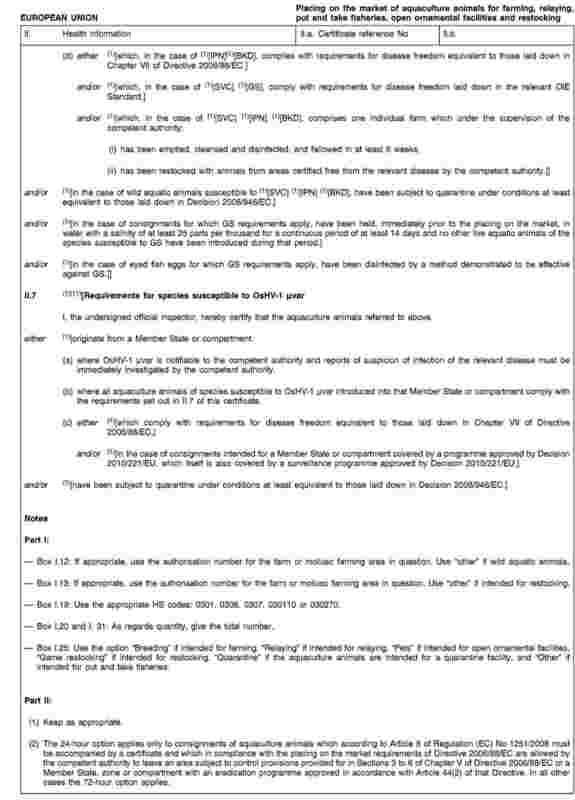 Annex II is replaced by the text in the Annex to this Regulation. 1. 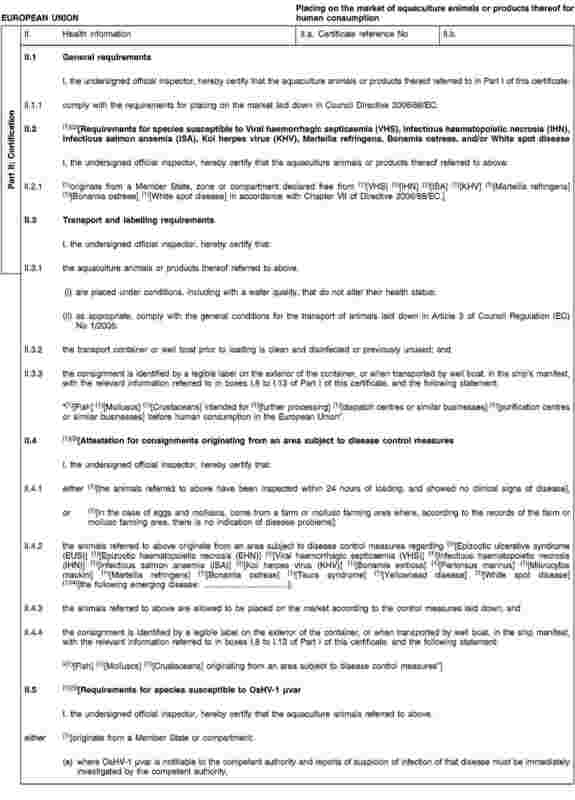 For a transitional period until 15 May 2011, consignments of Pacific oysters accompanied by animal health certificates issued in accordance with Part A or B of Annex II to Regulation (EC) No 1251/2008 before the amendments introduced by the present Regulation, and an animal health certificate issued in accordance with Annex II to Regulation (EU) No 175/2010 may be placed on the market provided that they reach their place of final destination before that date. 2. 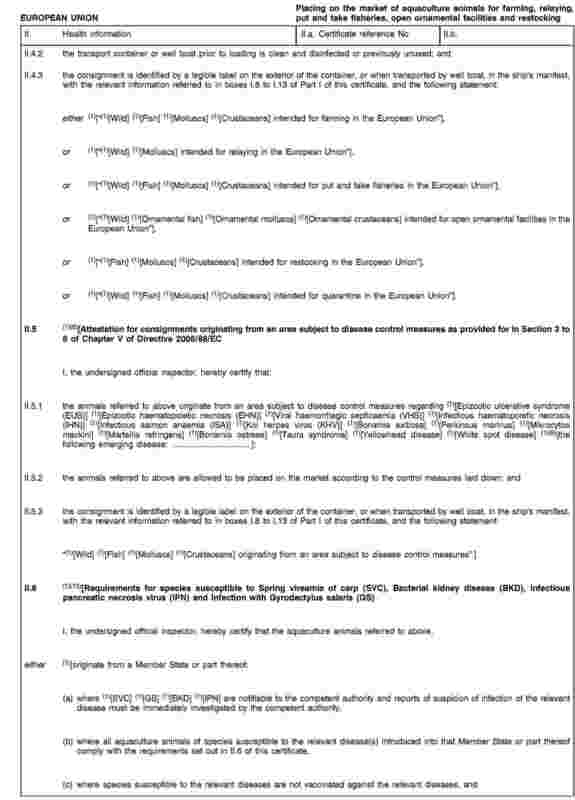 For a transitional period until 1 July 2012, consignments of aquaculture animals accompanied by animal health certificates issued in accordance with Part A or B of Annex II to Regulation (EC) No 1251/2008 before the amendments introduced by the present Regulation, may continue to be placed on the market provided that the animal health attestations as regards OsHV-1 μνar set out in Part II of those certificates are not applicable and they reach their place of final destination before that date. Done at Brussels, 11 April 2011. (2) OJ L 337, 16.12.2008, p. 41. (3) OJ L 98, 20.4.2010, p. 7. (4) OJ L 52, 3.3.2010, p. 1. (5) OJ L 80, 26.3.2011, p. 15.